Click on the image to see the candy inside the box. PERFECT! That's what you'll say when you receive this heart-shaped maple candy wedding favor. DELICIOUS! That's what your wedding reception guests will say when they taste this pure maple candy. Each 1.3 oz Heart-shaped candy also comes in its own individual white 4" tall box with clear plastic window. 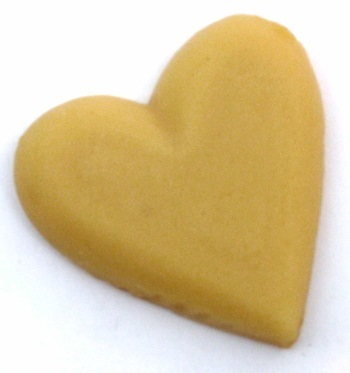 This Vermont wedding favor is 100% pure maple sugar candy. Everyone expects to see chocolates at a wedding reception party. What they don't expect is Vermont maple sugar candy. You may want to order a few extra as they're sure to disappear fast, leaving guests asking for more! We charge a flat rate for packing and shipping of heart-shaped maple candy wedding favors, which will be determined during CHECKOUT. Your favors will arrive via the United States Postal Service (USPS) Priority Mail. Local, hand-delivery is also available in the northern Vermont region.